Anyone who has ever been in the mountains at night or on looking in the dark for something in the tent , will appreciate the advantages of an LED head torch. So the small spotlights on the head allow optimum illumination of the field of view for many activities. Thanks to the elastic band, the headlamp can easily be secured to the heard or helmet so the hands stay free to look at maps during the night, put up a tent in the dark or go for an evening jog in the park for example. Modern LED headlamps often have multiple lighting modes. 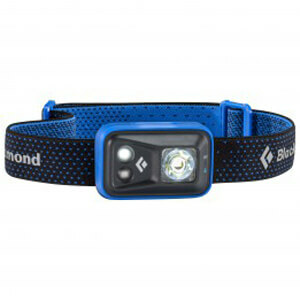 The light intensity of the headlamp can be intensified or dimmed simply by pressing a button. This allows the light cone of the LED headlamp to be optimally adapted to an individual's needs. Most LED head torches are powered by conventional batteries that are located directly in the housing of the headlamp or in a separate battery compartment. Professional headl torches for alpine mountaineering however, get their power from separate battery packs, which are stowed in a backpack and loaded externally. Especially in autumn and winter, many mountain sportspeople are surprised by the gathering darkness and wander around in the dark. So everyone should have a head torch for emergencies.